Would you like to coach people - and help them get more out of their lives? If so, why not become a life coach? It's important, fulfilling work; and well paid too. Your clients rely on you to give them direction. Often they're talented people who simply don't know where they should be heading. Sometimes, they don't recognize their needs, and they're pursuing the wrong kind of career. All too often, they'll tell you what they want out of life – within moments of your first meeting. But many don't know what's wrong with their lives. They just feel that they're dissatisfied. It could be their work. Or their marriage. Or their lack of spare time. Some people want to slow down, but don't know how. Others want more time for themselves. And so, armed with our strategies, you can inspire them to change their lives for the better. Men hate going to a traditional therapist. They don't like to admit they have a problem. But seeking a life coach doesn't carry the same negative connotations. There's no stigma. On the contrary, it's quite fashionable. That's why men - and women - are keen to have life coaching. Life coaches help people to achieve their goals. Some clients are stuck in a bad relationship. Others are in a dead end job, or are suffering stress at work. Others are having difficulty in their family relationships. While some are in debt, and can't see a way out. As a life coach, you can unblock these problems, liberate these people, and set them on a new course. What could be more exciting! The market is vast. At one time or another, everyone needs advice. And the people who are closest to the client are usually too close to the problem. They can’t see it with fresh eyes, the way you can. OMG Chris we did it, I say 'we' because I would have not done it without your encouragement as difficult as it was with my life changing at the same time. Thank you for not allowing me to give up, this is the best thing next to my son that has happen in a long time. Thank you from the bottom of my heart I will be celebrating with you in mind. May God bless you with all you desire and may your kind spirit keep holding up the torch of light in our dark moments as your students. Understanding someone's concerns and problems is a talent that's inside every human being. But you need the secrets of this course to bring out that skill. That's why the Diploma in Life Coaching course is so useful. It will turn you into a professional and successful life coach. Imagine getting paid for doing what you enjoy! Are there a lot of life coaches? Unlike the world of therapy and counselling, there's little competition - because there are few life coaches. Moreover, few life coaches learn how to promote their business on the net. Fewer still learn how to properly publicise their business in their locality. All of this we teach you on the course. When you study with us you'll access all the course materials online. Your course is fully personalized. We carefully mark your assignments, and show you how to improve. We provide advice that you can't get anywhere else, and we give you the encouragement that you need to succeed. The courses are based on the real world. 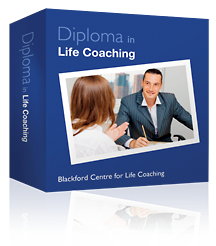 By the end of the course, you'll have met all the main problems that a life coach encounters. So you won't have any surprises when you face a client. You also have two advantages over life coaches who have learnt ‘on the job’. They have rarely been taught the craft in a systematic way (so they’re less professional); and they rarely know the full extent of coaching. What sort of people need life coaching? How do I direct the client? The course shows you how to market your life coaching practice on the internet. Plus, you’ll learn how to use the internet to coach on the internet. We’ll reveal how to get this work, and how to promote your services. People who find they're good listeners. They are people to whom others turn to seek advice. People who are interested in others, and who like to resolve people-problems. Counselors and therapists seeking to put their skills to good use. They know that coaching will always be in demand. People who want to supplement their income by working from home. Many need to fit their work around other commitments. You'll have learnt the skills of the life coach. You'll get free logos to put on your website and your letterhead. They give potential clients added confidence in your skills.